The Near 3 kpc Arm (also called Expanding 3 kpc Arm or simply 3 kpc Arm) was discovered in the 1950s by astronomer van Woerden and collaborators through 21-centimeter radio measurements of HI (atomic hydrogen). 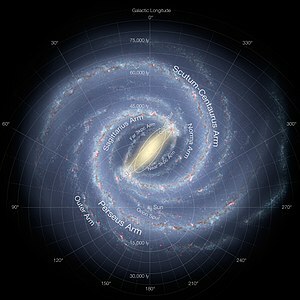 It was found to be expanding away from the center of the Milky Way at more than 50 km/s. This spiral arm contains about 10 million solar masses of gas, mostly hydrogen atoms and molecules. It is located in the fourth galactic quadrant at a distance of about 5.2 kpc from the Sun and 3.3 kpc from the galactic center. The last attempt to search for star forming regions in the Near 3 kpc Arm (in 1980) showed little star formation occurring in the numerous molecular clouds of this arm. Along with the Far 3 kpc Arm discovered in 2008, these inner arms establish our Galaxy's simple symmetry. This article uses material from the Wikipedia article "Near 3 kpc Arm", which is released under the Creative Commons Attribution-Share-Alike License 3.0.